As I went to the studio this morning, I noticed someone sitting behind the window of the door, someone who was apparently watching me. A guardian! From the inside of the studio came a lot of light. Normally, I work there with my colleagues. Some steps lead to the studio. The entire space was empty, everything was stowed away on a wall behind boards, only our naked tables were still there (without chairs) in a row crossing the space. The floor was shiny clean and there was a penetrant smell of disinfectant. In a corner near the entry was a puddle of urin. I was not alone. I noticed that, apart from the guardian, there were still a handful of other people whom I didn’t know who like him were wearing the same green-blue clothes. What are you doing here? Is this a performance? Are you allowed to speak? But they were also speaking, however. They were entirely natural, were eating their sandwiches, were looking upwards, …and nevertheless, in this circumstance, I don’t know if I can use the word “natural” here. It doesn’t seem to fit what I actually saw. Their presence astonished me. What made them behave this way? Like lightning I imagined I was in the house of a sixheaded monster, or an intruder amongst martians. I noticed also a real bird who was flying around in the atelier. 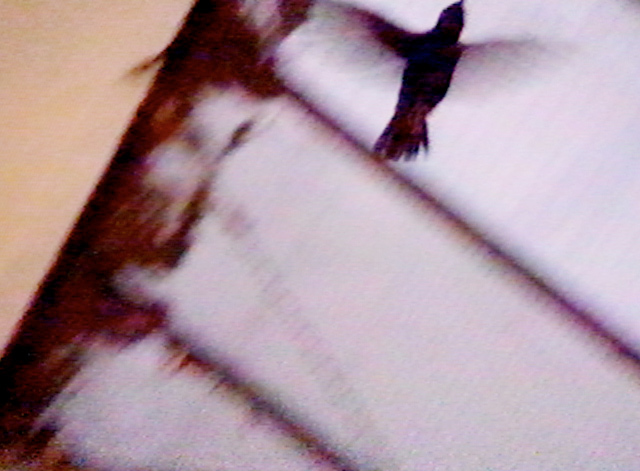 It wasn’t an exotic bird, but one from our region (a black one), as if by mistake it had flown through one of the panes. The occupants spent a lot of time with the bird, by watching it and by shouting at it. With each stroke of its wings was hidden one of their sights. The bird and they seemed to be attached to the same destiny. The bird was not allowed to escape. This was what the guardian was for, I think. (…) After this day the bird and the occupants disappeared.